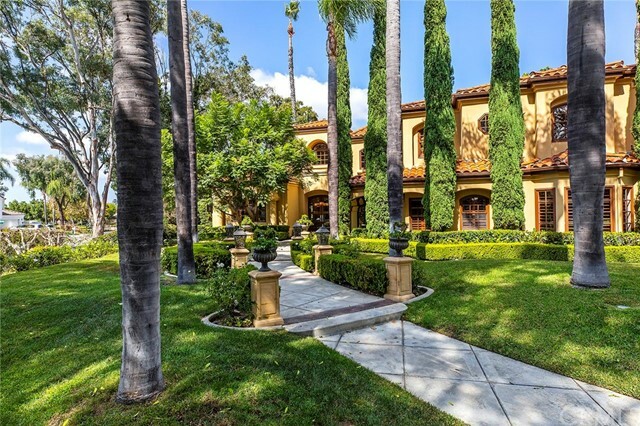 All Laguna Hills homes currently listed for sale in Laguna Hills as of 04/24/2019 are shown below. You can change the search criteria at any time by pressing the 'Change Search' button below. 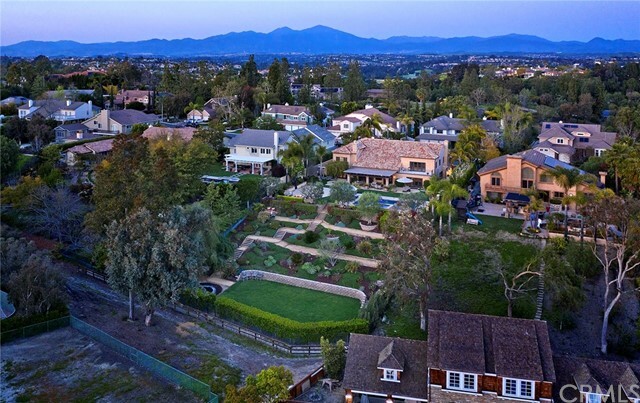 "One of the most significant homes in the equestrian community of Nellie Gail Ranch. This elegant custom design blends European architecture with a soft contemporary interior. Prominently positioned at the end of a cul-de-sac, atop almost 2 acres, the grounds afford true grand resort style living. This beautiful home offers seven bedrooms, eight bathrooms, two of which are ground level en-suites, home theater, library and dramatic first floor office. The large gourmet kitchen opens to the great/l"
"Reflecting the grace, style and massive proportions that have made Nellie Gail Ranch a genuine destination for savvy homebuyers, this grand estate combines a 1.6-acre cul-de-sac homesite with an exquisite floorplan of approx. 6,878 s.f. The equestrian zoned site reveals serene sunset views, a separate apartment, pool, spa, tee box and putting green, lighted tennis court, net zero solar system and garage parking for 12 including an RV. Custom craftsmanship refines the 5-bedroom, 5 and 2 half bath"
"Almost 6 acres in the heart of South Orange County!!! With only two owners and last available in 1981 this one of a kind jewel of Nellie Gail Ranch is an equestrian lover's dream and a once in a generation opportunity. Lower private equestrian area includes a 4 stall barn with tack room and office, multiple additional outdoor stalls, huge pasture area, your own private riding ring, and independent private paved road with access from Paseo De Valencia. 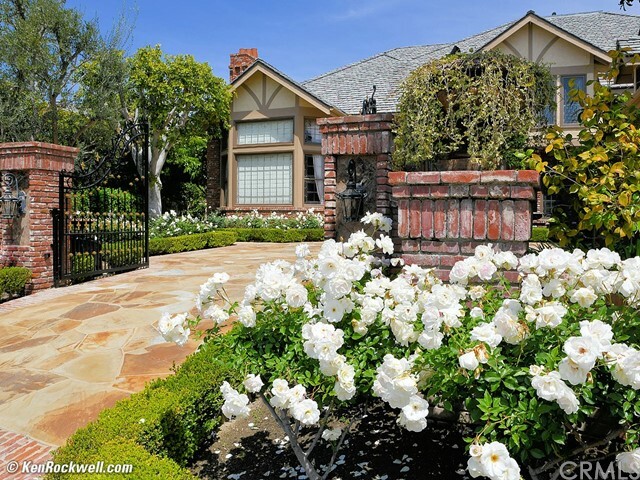 The home has a end of Cul-de-Sac location wi"
"This Newly remodeled Nellie Gail Ranch Estate is reminiscent of a Grand European Manor, Majestically hidden behind the stately, gated entrance. A tree lined double driveway and the sprawling, manicured lawn welcome you home. An impressive stone exterior, lead crystal windows and a tranquil koi pond lead to Large elegant wood doors that open to an architecturally dramatic entry/foyer. The grand, curved staircase and rich, dark hardwood floors are both warm and inviting. Over 9100 square feet with"
"AUCTION-STYLE BIDDING! SUBMIT AN OFFER NOW TO STOP THE AUCTION! OPENING BID OF $2,999,998. Submit offers before May 15th deadline. May be CASH or Financed, Proof of funds required. Seller will consider carry for qualified buyer. Be the first to reside and relax in this completely remodeled and reimagined home located on a quiet cul-de-sac in a historical equestrian community. Enter through the grand foyer to find exquisite European Blanco Romano marble floors, winding staircase, towering ceiling"
"Settled on an enchanting cul-de-sac in Laguna Hills Nellie Gail Ranch, this English Tudor mansion presents grand living spaces, upgraded luxury, and an undeniable touch of magic. From classic outdoor lights to a world-famous rendering of Mickey Mouse artfully centered in stained glass, the custom estate was designed by one of the original Mouseketeers. Today, it blends a hint of storybook style with a virtually endless list of today s in-demand appointments in a fl"
"CUL DE SAC, CORNER FLAT LOT WITH POOL, SPA AND LARGE BACKYARD LAWN. First time on the market in over 30 years. The lot is over 17000 square feet, custom estate of 5843 square feet with six bedrooms, five baths, five fireplaces and three garages. High ceilings, and gorgeous millwork throughout, solid doors and oversized windows. 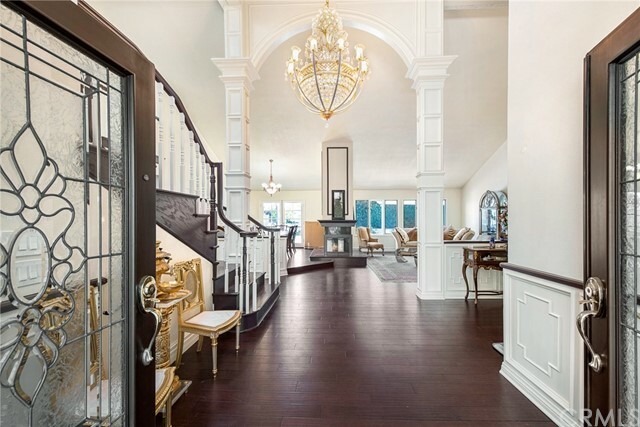 Stunning formal entry with two story ceiling accents the spiral staircase and hardwood floors. Oversized windows provide amazing natural light. The expansive open great r"
"Sublime style and a family friendly floorplan define this gorgeous newly remodeled Modern Farmhouse inspired Nellie Gail Ranch estate in Laguna Hills. On nearly 1 acre of park like grounds this home exudes sophistication and relaxed comforts. Embraced by mature trees that provide appreciated privacy this two story home measures approx. 4,741 s.f. and offers 6 bedrooms of which 2 reside on the main level, 5.5 baths, a detached pool house/casita approx (266 sq ft) is perfect for entertaining while"
"Proving that it is possible to find the ultimate combination of location, style and luxury, this elegantly remodeled European-inspired villa is among the most coveted in Laguna Hills prestigious Nellie Gail Ranch. Adjacent to a scenic bridle trail, the estate is complemented by a flat corner homesite on a prime cul-de-sac street. Approx. 23,790 s.f., enchanting grounds are graced with an L-shaped pool, spa, cabana and a built-in BBQ. Today s preferred interior amen"
"This incredible home has it all. Welcome to the amazing equestrian community of Nellie Gail. This gorgeous 5-bedroom, 5.5-bathroom, 2-story home presents nearly 6,000 square feet of living space. This beautiful estate is perched on a private corner-lot with a detached casita nestled in a bright open-air courtyard. The luxurious master suite has dual vanity areas, a spacious walk-in closet, and a retreat. All secondary bedrooms have their own bathroom and walk-in closet equipped with organizers. " "An extraordinary homesite at the end of a cul-de-sac extends nearly 17,313 s.f., offering generous space for a gated courtyard entry, 2 built-in BBQs, a detached casita, putting green, fireplace and a large pool with spa. Setting the scene for fabulous entertaining and elegant everyday living, a magnificent entry rotunda reveals a circular staircase, custom chandelier and wood ceiling. Grand archways distinguish a formal living room with fireplace and a formal dining room with French doors leadi"
"Nellie Gail's finest privately gated English Tudor home. Located on a quiet cul-de-sac. $2,500,000 almost down to studs remodel.Hand cut stone, leaded glass, extraordinary woodwork, custom moldings, custom wool carpeting, Austrian crystal chandeliers, medallion set into polished marble floors.Ornate ceilings. Enchanting powder room and children's turtle bathroom. Bedrooms all have lavish en-suite bathrooms. Solid wood paneled office.Bonus room. Walk behind wet bar. Granny flat with bathroom and "
"Showcasing the advantages & chic, modern flair of an extensive remodel and expansion, this stunning Nellie Gail Ranch residence in Laguna Hills is ready to enrich your lifestyle. Now measuring approx. 5,100 s.f., the on-trend design hosts 4 bedrooms & 4 baths, including a main-floor bedroom. A double-door entry introduces an impressive living room, formal dining room with outdoor access, & a phenomenal new great room. The great room opens to a custom kitchen designed by a chef for a chef, comple"
"It just doesn t get better than this! An equestrian zoned estate located upon 32,000 square feet of lush beautifully landscaped grounds sits a custom domicile graced with travertine floors and high vaulted ceiling to let you know. You ve arrived! There are abundant quality finishes every turn of the home to include a gourmet chefs kitchen with a center island, granite counters and custom cabinets with top of the line stainless steel appliances. The s"
"From the moment you enter this one-of-a-kind estate, you know you have discovered something genuinely special. A dramatic staircase introduces the second level, cathedral ceilings soar high above, and custom finishes and appointments impress at every turn. Expanded by nearly 500 sq ft and impeccably upgraded, this grand Steinway residence at Nellie Gail Ranch in Laguna Hills now measures approx. 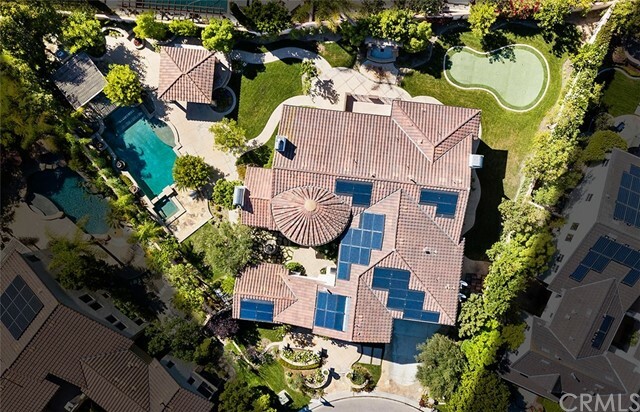 5,000 sq ft and features 5 bedrooms and 4.5 baths, including a main-floor ensuite and an office/6th b"
"Santa Barbara style meets a modern vibe at this spacious and bright remodeled estate in Laguna Hills Nellie Gail Ranch neighborhood. Slide-away accordion doors, skylights and vaulted ceilings harmonize with smooth, white interior walls to create an airy feeling throughout the two-story design, which extends approximately 5,218 square feet. Six bedrooms and 5.5 baths include dual master suites, with one on the main level opening to the backyard and hosting a fireplace, steam showe"
"Stunning and elegant home in the prestigious equestrian community of Nellie Gail. Impressive front walkway and gorgeous landscape invite you into the spacious entry. Grand, double living room with dual French doors face the front yard, perfect for your formal living space, a music room or a home office. The dining room with contemporary chandelier lead to a butler pantry and huge walk in pantry. The open kitchen boasts Wolf and Subzero Appliances. Two dishwashers, oversize island and recipe desk"
"STUNNING PANORAMIC VIEWS!! 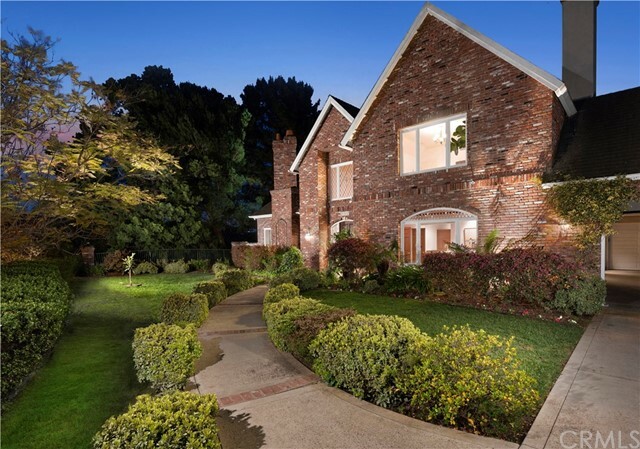 This exquisite newly remodeled contemporary located in Nellie Gail Ranch estate exceeds expectations in every way. 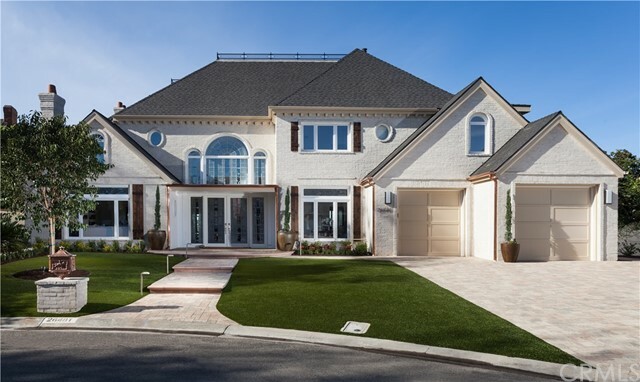 This stunning home reveals fine craftsmanship complemented by high ceilings, designer paint, crown molding, designer counters, wood, marble, and wool carpet flooring. 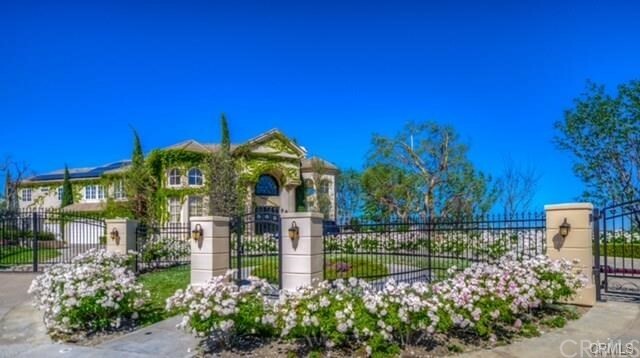 This Luxury 5 bedroom, 5.0 bathroom, possess 4910 sq.ft of living space featuring formal living room, dining room, den, great room, main floor bedroom, expansive master suite with lavish hote"
"Gracing a gentle hill, this estate complements grand living spaces with unparalleled attention to detail. Custom leaded-glass windows illuminate an entry that hosts inlaid wood flooring and opens to a formal living room with fireplace and Palladian window. Formal spaces continue with a dining room that opens to a view terrace. Casual entertaining is easy in a great room with walk-in wet bar, built-in entertainment center, beamed ceiling, stone fireplace and French doors that lead to the backyard"
"Simply one of the most beautiful backyards in all of Nellie Gail! This spectacular and very private setting will simply take your breath away with abundant roses, immaculate lawn, manicured trees and hedges, retractable awnings, stone pathways, resort-style pool and spa on a massive 22,000 sf lot. The Mediterranean architecture provides excellent curb appeal from all angles. Enter the home to find soaring vaulted ceilings, marble flooring and crown molding that opens to a formal living and dinin"
"Set apart from the rest is this EXQUISITE English Tudor Two Story Custom Estate which rises up to meet you, upon arrival. 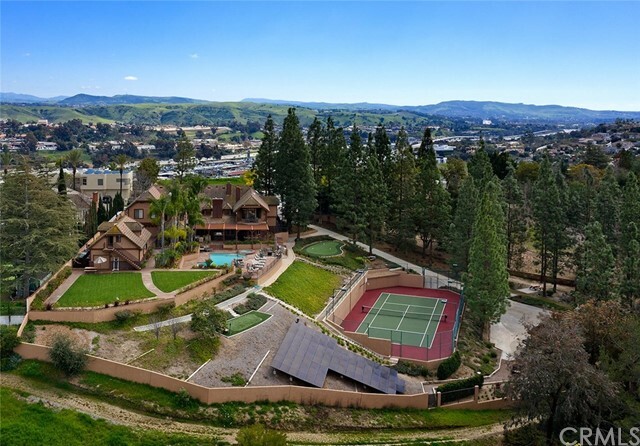 Tucked into the plush hills & whispering palms of the exclusive equestrian community of Nellie Gail Ranch is your private 6,000 sq.ft 6 bed/8 bath beauty! You & your guests are met by the stunning marble foyer w/dark wood banister detail & sparkling glass chandelier; to your right, a formal library invites you in for a game of billiards; to your left the formal living room ha"
"MAIN FLOOR MASTER BEDROOM-Nestled on an ultra-private and highly coveted cul-de-sac street in Laguna Hills prestigious equestrian-oriented community of Nellie Gail Ranch, this luxurious and stunning home offers a custom addition and fresh upgrades. Approx. 5,000 s.f., the open and light two-story design offers 5 bedrooms and 6 baths, including a main-level guest suite with full bath. Soaring ceilings, a hallway bridge, chandeliers and large windows combine to create an elegant ye"
"This large estate is located on a prime cul-de-sac in Nellie Gail Ranch. The home has 5 bedrooms, 5 full baths, and 2 half baths. This elegant floor plan is over 6000 square feet, with a grand entryway and 2 story high ceilings leading to a sweeping staircase. The gourmet kitchen has granite counters, large center island,and top-of- the- line appliances. It sits adjacent to the sun room that has built-in nook seating. The family room has a grand fireplace and entertainment center. 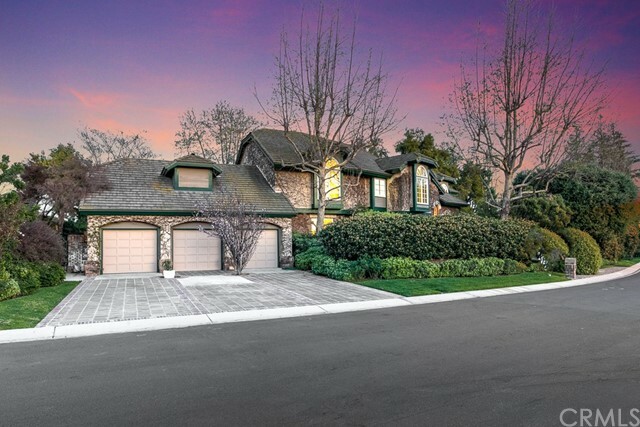 The master sui"
"Gorgeous Nellie Gail Ranch Home on a hilltop with an exceptionally large, beautifully landscaped lot size of approximately 30,225, perfect for entertaining. Desirable estate is two stories, 5 bedrooms, 4.5 baths, 3 car garages, 4,558 square feet total. Comfortable home includes vaulted two story entry, separate formal dining room, huge kitchen with center island, wet bar, living room, great room, downstairs office with lots of fine custom cabinetry built ins, huge master bedroom includes large m"